This is a For Your Information post. 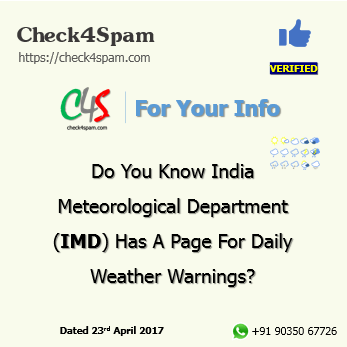 Please find more details about India Meteorological Department (IMD) Warning Bulletin at the verification section of this article. Surat Municipal Corporation has issued ‘RED Alert’ for 3 days. Please drink 6-7 liters of water a day, Avoid going out in open sun from 11AM- 4 PM. Circulate this message in family & friends. Mumbai/ Pune Municipal Corporation has issued ‘RED Alert’ for 3 days. Ahmedabad / Mumbai / Pune Municipal Corporation has issued ‘RED Alert’ for 3 days. The best way is to hear from the India Meteorological Department (IMD) themselves. And Yes they have a daily report shared at the below link. So just need to check these pages to know the official forecast or warnings for the day and the coming few days for all over India.